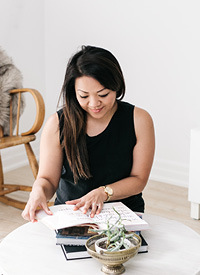 A Perfect Hawaiian Wedding — Love On Sunday Love On Sunday | Interior Styling in Toronto and the GTA. Have you ever been to an unforgettable wedding? I had the opportunity to watch my oldest girlfriend marry her soulmate in Honolulu, Hawaii. It was hands-down the most beautiful wedding I have ever seen. For some reason I was thinking about weddings today (not hinting at anything, I swear) and hers was stuck in my mind. Not only because she's one of my oldest and dearest girlfriends, but also because she's decor obsessed just like me. She has great style and I wanted to highlight all the beautiful little details she managed to serve up during her wedding. It's these small personal touches that really make my heart skip a beat. So lets begin shall we? White chrysanthemums and coral roses...love the placecards too! And check out where the ceremony took place. Could you not have a better view? Oh and that large basket near the back was holding umbrellas! They did come in handy since it did rain for a little bit but the sun quickly peeked it's head through and we were blessed with beautiful weather. I have to say that the programs were beautifully done. Great design, paper quality and the die-cut was so pretty. Something a graphic designer can truly appreciate. In fact, I still have mine! These were her giveaways for you to take home. A photographer would snap a photo of each couple and it was later mailed to you to display in this beautiful frame. What an amazing wedding, I'm so happy I was able to share that special day with them! Wasn't I right about the details? Have you been to any unforgettable weddings or events?